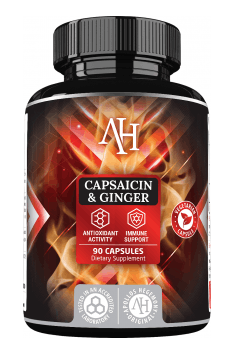 Capsaicin – a natural fat burner. How do we find capsaicin? Capsaicin is a component of many of the best fat burners on the market. Although its name may seem strange and exotic, with capsaicin we meet at every step.It is a natural chemical compound that has extraordinary power. What is capsaicin and how does it work? Capsaicin is a chemical compound contained in many products, responsible for the sensation of sharpness (spiciness).It has no fragrance and has the appearance of a colorless or orange liquid.Affects nociceptors, or pain receptors, thanks to which we feel a burning sensation, and in high concentrations even pain.It also activates the receptors responsible for the sensation of heat, so after the ingestion of capsaicin we can feel the tongue or cheek burning. Menthol works on a similar principle, but there is a feeling of coldness. Capsaicin in its pure form is extremely acute and according to the Scolville scale, it has 15,000,000 – 16,000,000 SHU units.For comparison, the popular Tabasco sauce, considered to be relatively spicy, has only 3000-5000 SHU.It was first isolated in crystalline form by American chemist John Clough Thresh in 1876. The Scolville scale is the focus unit used mainly for peppers.The SHU unit determines the degree of dilution of the capsaicin extract in which the focus ceases to be felt.For pure capsaicin, this ratio is about 16,000,000 SHU (116,000,000), so one liter of capsaicin would have to be dissolved in 16,000,000 liters of fluid to make it disappear.Bred in 2017, the hottest chilli pepper, named Dragon’s Breath, has a sharpness of 2 480 000 SHU. How does capsaicin burn fat? In addition to the taste sensations, capsaicin has one additional advantage – it enhances the fat burning process.How?First of all, it works thermogenically, that is, it raises body temperature.After eating food with capsaicin, pain receptors are activated, and the body goes into a fight with the source of pain.Increased body temperature along with the adrenaline and norepinephrine release require a lot of energy, and thus accelerate metabolism.They also activate the lipolysis of free fatty acids released from adipocytes (fat cells). But this is not the end of the salutary action of capsaicin.It has been proven that spicy foods are quicker to satisfy hunger and make us feel sated for longer.In addition, capsaicin reduces appetite, and its source is peppers, or low-calorie vegetables, rich in valuable nutrients (eg a very large dose of vitamin C).Therefore, the popularity of capsaicin in fat burning supplements is not surprising.Its action is confirmed scientifically many times and is not based on the placebo effect.Of course, it should be remembered that capsaicin only supports the slimming process and eating supplements will not replace a balanced diet. How do we find capsaicin? Peppers are the primary source of capsaicin. However, we must reach for these sharper chilli peppers, because ordinary red pepper does not contain capsaicin. Chili Pepperoni, Jalapeno, Piri-Piri and Habanero are excellent sources.For capsaicin we can enrich the dish, also add Cayenne pepper or spicy sauces containing pepper extract (eg Tabasco).We can also take kapsaicin in the form of dietary supplements.Fat burners work multifacetedly and significantly improve the weight loss process.It is worth remembering that the capsaicin inhibitor (blocking its action) is casein, therefore, for the most effective action, you should not combine capsaicin with milk products. There are many reasons to bet on capsaicin.It enriches the taste experience, helps in weight loss, and according to recent reports also works anti-cancer. Include capsaicin into your diet, and your weight loss will be even more effective!